Plug a microphone in a computer and have it react to sound. 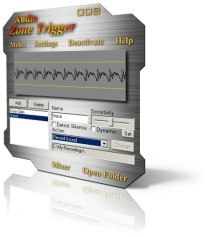 Audio Zone Trigger is the first multi-purpose sound detection software. This opens the door for all kinds of projects, you can now setup an automation system at low cost! Simply place audio triggers on the sound wave. They detect volume peaks and they perform the actions that you have selected. Useful in such sectors as Art, Marketing, Quality control, statistics, security and monitoring, audio detection can now be used by anyone with a computer. Use any sound capture device! 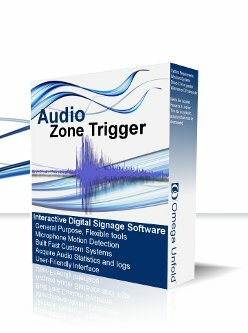 For each volume detecting trigger, you can choose from a wide range of actions that Zone Trigger will perform. Recording audio, playing sounds, executing commands on the computer... only a click away. 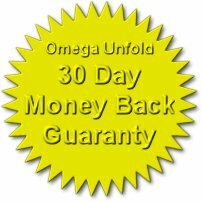 Omega Unfold software is backed by a rock-solid technical support service. We are very aware of the difficulties you face with computing, and we will always make sure you get the answers to your questions. Please do not hesitate to send us any comment or suggestion you may have about or software. Visit the Sales and Support page for products support resources, and the Contact Us page to get in touch with us.